Karin Alvtegen discusses Betrayal. ; Håkan Nesser reads from The Inspector and Silence. 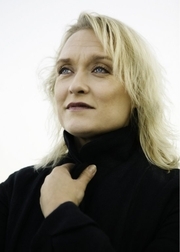 Karin Alvtegen is one of Scandinavia’s most widely read and popular authors and her books are also bestsellers worldwide. She also has received a number of literary awards. Karin Alvtegen is currently considered a "single author." If one or more works are by a distinct, homonymous authors, go ahead and split the author. Karin Alvtegen is composed of 10 names. You can examine and separate out names.